Day 2 of my Las Vegas vacation. I got up at 8 just as I planned, by the way I slept really good last night. I was asleep as soon as my head hit the pillow. I showered and got all dressed and went out for breakfast. It was a little strange to be Susan in every way but makeup and hair but I know some woman don’t do their makeup and hair first thing but trust me Susan without makeup and hair is not Susan. Trixie was just making Breakfast for everyone, she really is wonderful for doing this. We had a wonderful breakfast and then it was time to finish getting ready for the trip. Soon I was ready and out with everyone else. Of course, I had to get a few pictures. Peggy took a couple of me outside, this is my look for the day, casual daytime look. I really want to blend in as much as possible. 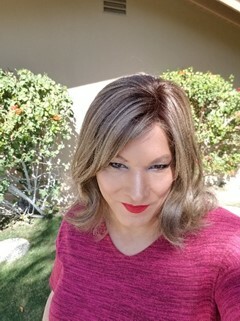 I know I don’t pass mainly because of my size but the goal is to dress like other woman so at least my look doesn’t draw attention although I did go with a matte red lipstick. We were ready to leave by 10:30. Julie had a way to go to avoid traffic and said it would cut the time in half, Julie and Cassandra had a friendly little bet on this as Cassandra said we could not cut the time in half and of course we are going to Las Vegas so why not start the betting early. It was a nice drive and save mileage and time and no traffic which was awesome but still took 4 hours so Cassandra won the first bet of the trip. Now Julie and Cassandra were traveling in their male mode so here I was traveling Susan with 2 men. The drive was easy and we got to our hotel just a little after 3. The bell hopes were wonderful and took our stuff out o the car and up to our rooms, 2 carts between the 3 of us, as girls we don’t travel light. We went in to check in and I didn’t feel the least bit strange, just handed Jake the man at the desk who was awesome my driver’s license and it was no big deal. Of course, Cassandra and Julie showed him pictures of how they would look this week. Then Jake showed us a picture of him from Halloween, he dressed up as Merilyn Monroe. All I can say is wow, white dress just like in Merilyn’s famous picture right down to the pose other then the dress blowing up around her. You almost thought you were looking at Merilyn and he did it himself, He got a few tips from his mom on the makeup and the rest was watching YouTube videos. Now Veronica, Cassandra and I have rooms right next to each other and Julie is a few floors up s she has a bigger room. Now Cassandra and Julie had to get ready and become their beautiful selves so I had at least an hour so I touched up my makeup and down to the casino to look around, always a good idea to figure out where things are although the casinos down town are not as big as the strip ones so much easier to navigate. I did sit down and play a little Black Jack to pass the time. I was up and down but having fun. As I played someone tapped me on the shoulder and I looked to see a man and turned back to the table but something was familiar so I turned back and it was Michele, she came in today instead of on Monday what a nice surprise. She sat down and played some Blackjack with me. The lady next to me was so cute. As I could tell she wanted to ask some questions, sometimes you can just tell. She asked where I was from and I told her Portland and that I was down here with friends for Diva Las Vegas a transgender get together. This helped as she said to me, I really don’t want to offend you but can I ask you some questions? Turns out she is a principle in a school and they have some kids who are transgender. Now I will say this is one thing that does bother me but not for what you are thinking. The fact some are so afraid to ask questions, I understand a lot maybe most transgender want to pass completely which is really hard if not impossible for most and they can find it offensive to be asked as they feel they have failed in some way. I realize I do not pass, well maybe in a really dark bar or at a far distance and the light is right. I will never get upset or be offended by someone who just wanted to know more about me or transgender so I told her to ask away so we talked a little as we played. I still think she felt uncomfortable asking me even though I tried to let her know I was fine with it. I think it’s the asking things about a person you just met. Well after an hour she had to leave and of course I felt I should go see how close Cassandra and Julie were to being ready as it really does take a while to get ready. 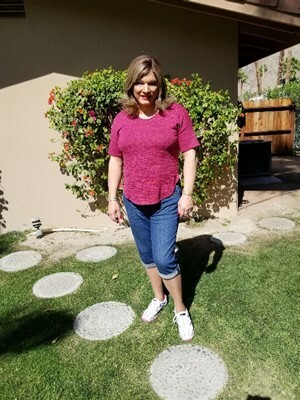 I tell woman this all the time, one of the benefits of dating or being married to someone who is transgender is you will never hear “what is taking you so long getting ready” Cassandra was almost ready and Julie was still a little bit away. As this is getting long now I will end here and have a new blog for tonight and what we do.